Last year I dropped the ball and didn’t get around to mentioning the climbing podcast Off Belay until after it had gone belly up. Bummer. Fortunately, the speculation at the time that co-host Chris Kalous would return with a new solo podcast has come to fruition in the form of The Enormocast. 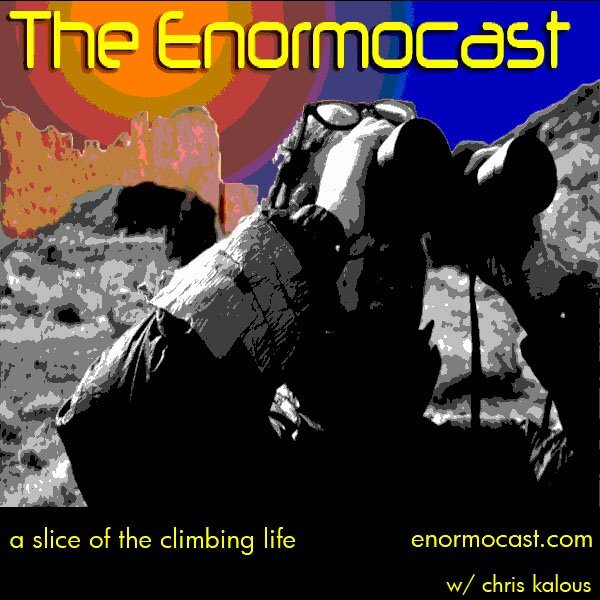 The Enormocast “soft” launched late last year into this year with fun episodes chatting with BJ Sbarra from Splitterchoss and Andrew Bisharat of Rock & Ice fame among the early guests. The soft launch is definitely over this week though as Hayden Kennedy sat down with Kalous for a two-part interview to talk about his season in Patagonia that you may have heard a little something about. If you want to use The Enormocast “like a slippery kneebar” and only listen to one episode you can download part 1 of the Kennedy interview here, but I would recommend just subscribing to the whole podcast in iTunes. The Dirtbag Diaries turns five. This also happens to be our 100th episode. To celebrate the occasion, we reached out to our collaborators, our contributors and our friends and asked for ideas. I pitched them a bunch of ideas. They shook their heads. Their response was resounding. “We want to hear your story, the story of the Diaries,” they said. Our intern, Austin Siadak, stepped forward to do the interview and relay the story. Congrats to Dirtbag Diaries creator Fitz Cahall on sticking with it this long. Here’s to another five years? ?